This Sunday I went to watch Cheltenham Town Development Team take on Wootton Bassett. Due to there usual ground having issues with over usage the fixture was moved eight miles down the road to Tewkesbury School on a 3G pitch in an enclosed pitch surrounded by a large metal fence which meant for cramped conditions for Bassett’s merry band of supporters. Bassett started much the stronger against a well organised Cheltenham team who had not played a competitive fixture in six weeks. Strikers Hayley Huckin and Emily Arell who had scored 36 league goals between them already this season had good chances to take the lead. Fans favourite midfielder Lisa Coe performed her trickery on the left to try and unlock Cheltenham’s defence but they were equal to the challenge. At the other end, Cheltenham had a good chance only for Bassett keeper Abi Footner to smother the ball. The Cheltenham keeper got herself in a terrible mess when coming out for a ball but was saved by her defence. The stalemate was ended on the half-hour mark when Huckin tried to lob the keeper only for the ball to hit a Cheltenham defender who deflected it cruelly into her own net to give Bassett a deserved 1-0 lead at the break. Cheltenham Town Reserves stayed on the field for there half time team talk whereas joint Bassett managers Jonny House and James Goddard took their team on the lengthy walk back to the changing rooms for the interval. A decision they must have regretted because Bassett could not get going after the restart and were penned in there half by Cheltenham in the early stages of the second half. Cheltenham had good chances to equalise but Bassett’s miserly defence which had only conceded nine league goals all season stood firm. 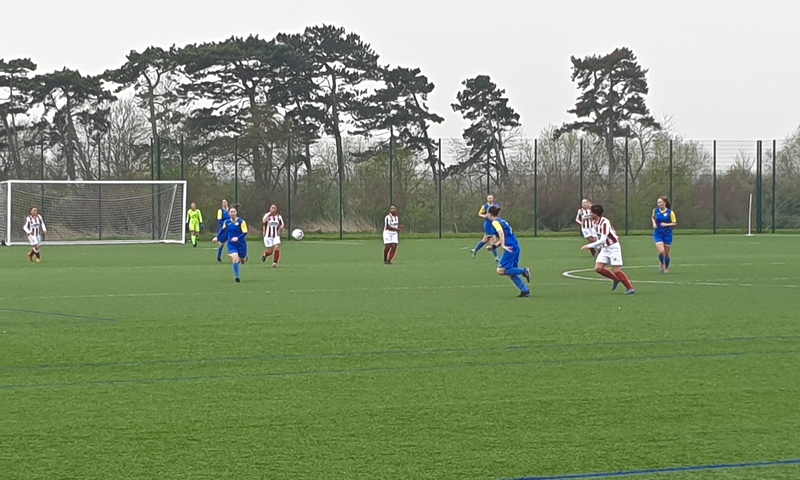 Bassett began to show glimpses of there first half performance with a good counter attack as captain, Laura Jefferies, found Huckin only for Cheltenham to thwart them with a goal-saving tackle. Cheltenham finally thought there hard work had paid off when they won a penalty but it went awkwardly wide, not even testing Footner in the Bassett goal. The away supporters cheers quickly turned to groans as Lauren Kayll appeared to have put the ball over the line, only for the referee to adjudge that it was cleared off the line. Cheltenham’s hard work paid off in the 90th minute when Jess Wadey scored from a corner to earn them a hard-fought point as Bassett where left ruing a poor second-half performance but should have scored more goals. The home team must take great credit for the way they came back into the game and what has been a very good season for them at all levels. Their first team under the guidance of Alex Cheal have had some fantastic results this season and as a wonderful gesture by the club, they will play their fixture against Swindon Town at the men’s stadium on April 27th. Bassett will play Swindon Town development at Fairford Town FC this Sunday where a win will surely be enough to secure the league title and subsequent promotion to tier five. Frampton Rangers will be at home to Laverstock & Ford Ladies and will be prepared should there be any further slip-ups It promises to be a very exciting afternoon!